Ocean disposal of society's waste got its start indirectly long before the Agricultural Age when nearby streams, lakes, and estuaries were useful as waste repositories. As civilization moved to the coastal zone and navigation began in earnest, the oceans were viewed as even a larger waste repository. Early civilizations were located adjacent to bodies of water for sources of food, irrigation, drinking water, transportation, and a place to dispose of unnecessary items. Historically, the disposal of wastes into water by humans was universally practiced. It was a cheap and convenient way to rid society of food wastes (e.g., cleaned carcasses, shells, etc. ), trash, mining wastes, and human wastes (or sewage). The advent of the Industrial Age brought with it the new problem of chemical wastes and by-products: These were also commonly disposed of in the water. ©Claude Charlier/Corbis. Reproduced by permission. Early dumping started in rivers, lakes, and estuaries, whereas ocean dumping was simply not used because of the distance and difficulty in transporting waste materials. The wastes from ships, however, were simply dumped directly into the ocean. As civilization developed at river deltas and in estuaries adjacent to the ocean, and these areas soon began to display the effects of dumping, disposal in the ocean became a popular alternative. Over the past 150 years, all types of wastes have been ocean dumped. These include sewage (treated and untreated), industrial waste, military wastes (munitions and chemicals), entire ships, trash, garbage, dredged material, construction debris, and radioactive wastes (both high- and low-level). It is important to note that significant amount of wastes enter the ocean through river, atmospheric, and pipeline discharge; construction; offshore mining; oil and gas exploration; and shipboard waste disposal. Unfortunately, the ocean has become the ultimate dumping ground for civilization. It has been recognized over the past fifty years that the earth's oceans are under serious threat from these wastes and their "witches' brew" of chemicals and nonbiodegradable components. Society has also come to understand that its oceans are under serious threat from overfishing, mineral exploration, and coastal construction activities. 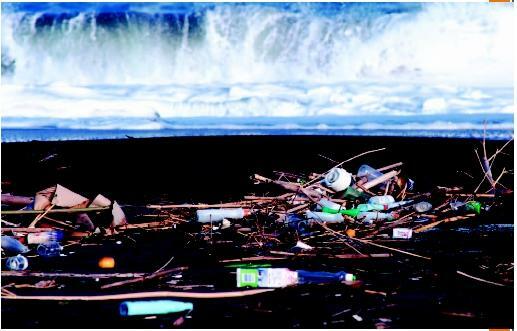 The detrimental effects of ocean dumping are physically visible at trashed beaches, where dead fish and mammals entangled in plastic products may sometimes be observed. They are additionally reflected in the significant toxic chemical concentrations in fish and other sea life. The accumulations of some toxins, especially mercury, in the bodies of sea life have resulted in some harvestable seafood unfit for human consumption. Seriously affected areas include commercial and recreational fishing, beaches, resorts, human health, and other pleasurable uses of the sea. During the 1960s numerous groups (global, regional, governmental, and environmental) began to report on the detrimental impact of waste disposal on the ocean. Prior to this time, few regulatory (or legal) actions occurred to control or prevent these dumping activities. Late in the nineteenth century, the U.S. Congress enacted Section 10 of the River and Harbor Act of 1890, prohibiting any obstruction to the navigation of U.S. waters. The authority to implement the act through a regulatory permit program was given to the secretary of the army acting through the chief of the U.S. Army Corps of Engineers. In the late 1960s the corps enlarged the scope of its review of permit applications to include fish and wildlife, conservation, pollution, esthetics, ecology, and matters of general public interest. In addition, the National Environmental Policy Act of 1969 (NEPA) required the review of policy issues pertinent to the public interest and an environmental impact statement on activities that might significantly affect the quality of the environment. In 1972 the U.S. Congress passed the Marine Protection, Research and Sanctuaries Act (Ocean Dumping Act or ODA) and the Federal Water Pollution Control Act amendments (Clean Water Act or CWA) that set a global standard for managing environmental restoration and protection, for maintaining the environment within acceptable standards, for prohibiting the disposal of waste materials into the ocean, and for regulating the discharge of wastes through pipelines into the ocean. With the enactment of these laws, the corps's regulatory program became quite complex. The goal of the CWA is to restore and maintain the chemical, physical, and biological integrity of the nation's waters, with the corps responsible for regulating the discharge of dredged material into inland and coastal waters. The ODA regards oceans in a somewhat similar manner, requiring the review of all proposed operations involving the transportation or disposal of waste materials and their potential environmental impact. The corps also manages the ocean dumping permit program. Like the CWA, the ODA is concerned with the unregulated dumping of materials into ocean waters that endanger human health and welfare, the marine environment, and the earth's ecological systems, and that may have dire economic consequences. The corps implements these programs in full partnership with the U.S. Environmental Protection Agency and is subject to their oversight. 1982 UN Convention on The Law of the Sea (UNCLOS 1982) (entry into force: November 1994); Provides a framework for the determination of the rights and obligations of states relating to the oceans. Part XII contains provisions with regard to protection and preservation of the marine environment. International Convention for the Prevention of Pollution from Ships, 1973, as modified by the protocol of 1978 relating thereto (MARPOL 73/78) Provides measures for ships and national administrations to prevent pollution by oil (Annex I), noxious liquid substances in bulk (Annex II), harmful substances in packaged form (Annex III), sewage (Annex IV), garbage (Annex V), and air pollution from ships (Annex VI). Convention on the Prevention of Marine Pollution by Dumping of Wastes and other Matter (London Convention 1972) (entry into force: August 1975) Provides measures to limit the use of the oceans as disposal area for wastes generated on land. Federal Water Pollution Control Act Amendments of 1972 (CWA) To restore and maintain the chemical, physical, and biological integrity of the nation's waters. 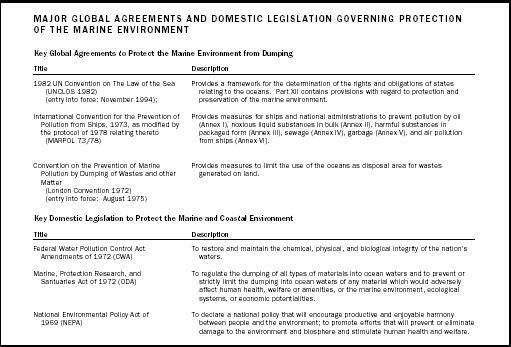 Marine, Protection Research, and Santuaries Act of 1972 (ODA) To regulate the dumping of all types of materials into ocean waters and to prevent or strictly limit the dumping into ocean waters of any material which would adversely affect human health, welfare or amenities, or the marine environment, ecological systems, or economic potentialities. National Environmental Policy Act of 1969 (NEPA) To declare a national policy that will encourage productive and enjoyable harmony between people and the environment; to promote efforts that will prevent or eliminate damage to the environment and biosphere and stimulate human health and welfare. in 1973. Countries signing MARPOL agree to enforce bans on dumping oil and noxious liquids into the ocean from ships, but the disposal of hazardous substances, sewage, and plastics remains optional. There are dozens of other international agreements dealing with ocean pollution, but the LC-72 and MARPOL are the most significant as far as dumping is concerned. The United States is an active member of both of these treaties. The LC-72 and domestic ODA are similar in structure and requirements, with the U.S. regulation being more stringent. The dumping of industrial wastes, radioactive wastes, munitions (chemical or biological), sewage, and incineration at sea are directly prohibited. Moreover, the ocean disposal of other waste materials containing greater than trace amounts of certain chemicals (i.e., mercury, cadmium, petroleum hydrocarbons, chlorinated chemicals, and nondegradable plastics) is strictly prohibited. Allowed under strictly regulated conditions are the ocean disposal of dredged material (harbor sediments), geologic material, and some fish waste; burial at sea; and ship disposal. The corps and the U.S. Environmental Protection Agency (EPA) implement the LC-72 and ODA in the United States. The Corps issues its permits after careful assessment using environmental criteria developed by the EPA. About 350 million tons of sediments are dredged annually in U.S. waters for the purpose of navigation for trade and national defense; approximately 20 percent of this total is disposed of in formally designated sites in ocean waters. A small portion of sediments from major harbor areas (about seven to ten percent of the national total) is sufficiently contaminated that ocean placement is not allowed, and the sediment must be contained at regulated land sites. Proposed ocean disposal is assessed through the use of an effectsbased approach, which evaluates the dredged material as a complex substance that may contain a wide variety of contaminants. The assessment will identify those sediments that may be detrimental to ocean biota and human health. The effects-based approach uses bioassay test organisms to integrate the potential effects of all the contaminants present in a combined impact assessment. This is done through the use of bioassays for acute toxicity and an estimate of contaminants' bioaccumulation potential. An assessment is also made on the potential of sediment contamination to impact water quality. A decision is then based on the suitability of a material for unrestricted or restricted ocean disposal, or not. For example, a dredged sediment from a contaminated portion of a harbor can be prohibited from ocean disposal and must be placed in a land containment facility. In highly industrialized harbors such as those in New York or New Jersey, dredging and the disposal of dredged material are often controversial. Ocean placement is not allowed except in the case of the cleanest sediments and adding to the controversy, land disposal locations are very limited and very expensive. In contrast, world trade and shipping, which depend on navigation dredging for deep channels, are a vital component of regional and national economies. The long-term solution to contaminated sediments will depend on waste control from land sources and the cleanup of highly contaminated sediments that continue to impact the navigation channel. The ocean placement of suitable dredged material or sediments at carefully selected ocean sites may be environmentally safe in relation to other alternatives. It might even be beneficial to the ocean through proper management. Eroding beaches, for instance, often receive clean dredged sand as a routine part of environmental improvement programs. Dredged material comprises 95 percent or more of all ocean disposal on a global basis. As navigable waterways and their role in world trade and defense continue to be important components of the economic growth and stability of coastal nations, the environmentally sound disposal of suitable dredged materials into the ocean will remain a necessary alternative. Moreover, the beneficial uses of these dredged sediments (when they are not contaminated with pollutants) for beach replenishment, wetlands, construction, aquatic and upland habitat improvement, and as construction materials will remain the highest priority in sediment and ocean disposal management. SEE ALSO B IOACCUMULATION ; C LEAN W ATER A CT ; D REDGING ; O CEAN D UMPING B AN A CT ; R IVERS AND H ARBORS A PPROPRIATIONS A CT ; W ATER P OLLUTION ; W ATER P OLLUTION : M ARINE . Committee on Public Works, U.S. House of Representatives. (1973). Laws of the United States Relating to Water Pollution Control and Environmental Quality, 93-1. Washington, D.C.: U.S. Government Printing Office. Engler, R.M. (1980). "Prediction of Pollution Potential through Geochemical and Biological Procedures: Development of Guidelines and Criteria for the Discharge of Dredged and Fill Material." In Contaminants and Sediments, edited by R.A. Baker. Ann Arbor, MI: Ann Arbor Science Publications. Engler, R.M. (1990). "Managing Dredged Materials." Oceanus 33(2):63–69. Engler, R.M. ; Saunders, L.; and Wright, Thomas. (1991). "Environmental Effects of Aquatic Disposal of Dredged Material." Environmental Professional 13:317–325. Engler, R.M. ; Saunders, L.; and Wright, T. (1991). "The Nature of Dredged Material." Environmental Professional 13:313–316. Huber, M.E., et al. (1999). "Oceans at Risk." Marine Pollution Bulletin 38(6):435–438. International Maritime Organization. (1991). The London Dumping Convention: The First Decade and Beyond. London. Nauke, M. (1985). "Disposal at Sea of Dredged Material under the London Convention." Dredging and Port Construction May:9–16. Greenpeace. Available from http://www.greenpeace.org/~odumping . London Convention of 1972. Available from http://www.londonconvention.org/London_Convention.htm .